There are some serious prizes on offer 🙂 but seemingly only for Queensland residents 😦 Though the website seems to be contradictory on this point. However anyone can take the course. There are eight modules in all, which start at 2 week intervals. They cover most applications, services and tools that users will find useful, from mash-ups to Skype to MMORPGs. 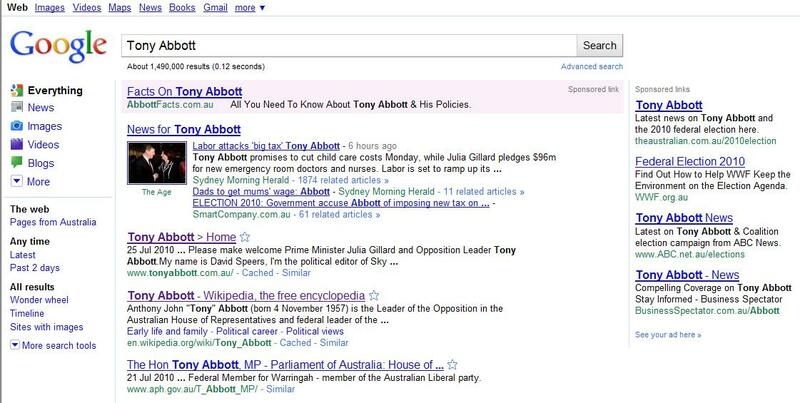 The 2001, 2004 and 2007 Australian federal elections were hailed in different ways as making Internet history. The 2001 election saw the widespread first use of personal websites by candidates and the first attacking mini-sites produced by the major parties. The 2004 election saw the first widespread usage of sites such as MySpace, video and blogs. In 2007 building on the lessons of 2004, there was much wider use of all social networking platforms and online channels and sites such as Kevin07 that were tailored to interact with the voting public. In 2010, the current election seems to show no progress in online campaigning and in some cases has even moved backwards. Yes, there are many websites, blogs, facebook presences, twitter accounts and video channels, but they are invariably not social or interactive. The minor parties, in particular The Australian Greens (notably Andrew Bartlett and Scott Ludlam) have used social media, online advertising and online communication to good effect. But the major parties are seemingly only using online media as a vehicle to push content streams. The facebook pages, created for the parties and leading candidates offer little real engagement with their ‘like’ supporters by the principal actors, but mainly just provide a drip feed of policy announcements and media releases. The comments areas appear to be moderately badly, if at all, and are beset by trolls from either side of politics who hijack any useful conversation. The Labor party has created many campaign videos and mini-sites as well as a Phoney_Tony twitter presence and Labor Connect (a social networking website). They have also created highly moderated blogs that generally have media releases as posts. The (YouTube) video channels are being used by both parties to project election advertisements to the television media, so that they may be picked up and distributed for free as news content. The television, and in particular the television news cycle, for the major parties is apparently still king, and the 70+ % of online users are being somewhat ignored. This is very much not an Internet election, at least on the part of the major parties. Maybe it is because the policies that the parties have that are directly relevant to the issues of Internet users are not central to their platforms. There are 2 major issues of relevance, the National Broadband Network and ISP filtering and storage of user information. Neither of these issues has been debated by the parties during the election in any substantial way. Another issue that may be restricting Internet usage may be lack of money as mentioned in this SMH article. However lack of money would normally indicate a reduced TV budget and an increased online strategy, which we aren’t seeing. But let us wait and see how the online election develops in the next couple of weeks. I would have posted to Library day in the life, but it was limited to ‘Any one who works in a library.’ I am a librarian but am curently working outside of a library (in Knowledge Management). Maybe it would be better to do a librarian day in the life, then we could see what librarians do beyond libraries. For the record I was writing policy documents, so my day in the life would probably not have been rivetting reading. There are apps for everything: calendars, calculators, alarm clocks to wake you up, global time zone converters, apps for blogging or microblogging, for checking your email or Facebook, for getting the score in the latest football game or checking out what’s happening in your local library. In fact, there are more apps than you could poke a stick at, and more are being developed everyday. Check out this great infographic about all about apps from MBA Online. A new paper Consumer Password Worst Practices shows that users don’t create strong or safe passwords, and why it is important that they do. Do you have a strong password of 8 characters or more, using both letters and numbers for your personal email, your bank, your facebook? Presumably you would want to keep that information secure. Have you ever struggled to read a CAPTCHA? Did you know Google has been crowdsourcing corrections to its digitised books for a couple of years now by using their reCAPTCHA service – see http://www.google.com/recaptcha/learnmore. So those sometimes hard to read words were actually often taken from texts and they were too hard for a computer to read, so they were outsourced to you. Over 5 billion corrections have been made not by volunteers but by websites making millions of people fill in those 2 word CAPTCHAs that verify that you are not a spammer. Library Volunteers – is it them or us? In the UK the recession and budget deficit has been and will continue to have a major impact on libraries. Local authorities are making cuts to services across the board and libraries are not exempt from this. Coupled with this is the new Coalition government’s Big Society plans which promote a new paradigm of community participation and volunteering. Libraries have been home to volunteers for many years, this new policy extends that by implicitly stating that volunteers may run libraries. When I go up and down the country and speak to council leaders, social entrepreneurs and local activists it’s clear to me that there is a real hunger out there to do more – to take on more responsibility and have more control. It’s by asking those questions that you arrive at so many of this coalition’s most transformative ideas. The trades union movement has been quick to condemn the plans, understanding that every time a volunteer is allowed to do something that previously a worker was paid for did, then staff cuts will follow. Make no mistake, this plan is all about saving money, and it will cost even more jobs and lead to more service cuts. The Government is simply washing its hands of providing decent public services and using volunteers as a cut-price alternative. We don’t want jumble sales to provide incubators for babies, we shouldn’t have volunteers taking over our libraries or museums, and where are all these people with time on their hands going to come from? Are we going to pay an army of newly unemployed to help run services? It has been said that volunteers will only be used to fill in those times that there are no paid library staff (many UK libraries are already closed at least one day during the working week as a cost saving measure). But those closed times are only there as a result of previous spending cuts. Any volunteer working those during times therefore is supporting a system that entails short working weeks for paid staff. Even if volunteers are working when paid staff are present, is the work they are doing not the work that someone should be trained and paid to do. Already there have been strikes in the UK over usage of volunteers to replace paid library workers. In the US there have been very many instances wheren supporters of libraries in the local community have campaigned to preserve library services facing cuts to hours and staffing. However the rise of the volunteer has also been felt in the United States, where again they have been linked to job losses. The US has had a longer history with volunteerism often to their financial advantage. However, in particular with library boards, this has not benefitted libraries and has been the cause of many censorship battles and has resulted in library professionals losing their positions for holding to librarianship principles. In Australia, we do not have the budgetary constraints as are being felt in Europe and the US. But we do have many public library services that are underfunded. We are not currently facing the issues with volunteers that are causing tensions, but we should not be complacent. To forestall any future problems, every Australian library should have a volunteer policy that accords with the ALIA policy on volunteers. Library services can be enhanced by well supported volunteers, and providing volunteers with meaningful community roles is a legitimate function of a public library service. 2.	to establish and maintain library services or outreach programs which would normally be established and maintained by paid library staff. In Australia we also have the benefit of a coordinating body Friends of Libraries Australia (FOLA), who are supportive of libraries and the librarian’s role. Library volunteers should be encouraged to join and be represented by FOLA, so that our mutual interests are preserved. If Australia’s public libraries are to make the best contribution they can to helping families and people through harder economic times, councils and state/territory governments need to improve investment in their public libraries as an inclusive people priority, even if their own funding circumstances become more difficult. Where Cameron’s Big Society idea is relevant and useful is in communities where there are limited services. In the UK, as here, there are regional areas that do not have a library, shops, post offices or banks. Community activism to provide these services for themselves is a very good thing, as relying always on the state or commercial interest is never a good policy. So where there is no library a community of volunteers setting up their own library is to be welcomed and fully supported. Where there is an extant library it should be part of that community, in fact, it should be at the heart of it. As such, volunteers should always be welcomed, but not at the expense of staff or expertise. So what work should volunteers be doing in a public library? From my experience as someone who has previously run public libraries working out what volunteers could do was a job in itself. Much of the (oft considered tedious) work such as shelving, tidying etc. in my libraries was already done by people, forced on libraries, who were sentenced to do community service (that in itself was a major but different headache). The rest was done by staff, or by employing older school children in the late afternoons. This latter option was far preferable than having volunteers do it as those young people earned small sums, but also learnt valuable library skills for their future studies and we could provide them with a safe working environment, much better than a shift at McDonalds. So in my libraries at least volunteers ended up doing book repairs mainly. It is not economically viable to repair books if paying staff to do it, but with volunteers it is. Thus in this way books were preserved for the collection and volunteers had a role, and there was no staff impact. There were of course other volunteers who were centrally organised to deliver books to the housebound and assist local heritage collections. Many of the volunteers that libraries have are retired professionals with many skills and attributes. And many libraries are short staffed and so it is very tempting to allow these capable volunteers to do more. But we must remember Librarianship is a profession, and as such we need to protect it. We cannot continue to maintain that we are a profession if we allow non-professionals to do it. Where I think volunteers should be used is in creating volunteer initiated projects and courses. Volunteers with the library’s help should use the library as a place to coordinate their own work and utilise their skills for the benefit of the community. Volunteers could set up and run IT training for other users. Volunteers could organise talks and classes depending on their interests and skills, or reading groups, or adult literacy classes. They could even be used to fund raise! Then of course there is always the often overlooked voluntary skills in a library. Volunteers can be people with trade and craft skills too. Why not get them to improve, beautify and repair the library. There is a profound benefit there and it is one that does not clash with library staffing interests either. Whether it’s the craft group who create works to brighten the library or the person who can paint, restore or build things, these are valuable contributions. Volunteers should be used to value-add services to a library rather than be used as a cheap source of labour which demeans us and them. The library as place would then be immeasurably improved by adding more volunteers and more community engagement. This too should be the route for larger libraries. Already all state libraries have volunteer programs. Most commonly the work involves conducting visitor tours, but there is often some form of indexing, checking or data entry jobs. It is fair to say that frequently the latter voluntary tasks are tedious and repetitive work not favoured by library staff, and which do not fully reflect the volunteers skill sets. The volunteers system should be one whereby a volunteer should propose a project (that ultimately benefits the library) and then receive library support (as in a desk, computer, ladder etc.) to complete that project. A project could be something small like creating a bibliography of the library’s holdings on a particular subject. There are always numerous items in a large library which are overlooked; getting volunteers to work on exposing collections would be a useful task. With the growing aged population, there will be many more active retired people in the community, who have time and skills to offer. Libraries should adapt their volunteer programs to fit that growth. The above mentioned has referred to the in-house volunteer. The vast number of volunteers however in future will actually be found online. The large numbers of people prepared to work on Wikipedia or supply corrections to the NLA’s newspaper digitisation program testify to the utility of crowdsourced volunteer programs. All these volunteers require is a clear goal and a workable online system and they can do transformative work. Please read Rose Holley’s excellent paper Crowdsourcing: How and Why Should Libraries Do It? for more on this subject. The online volunteer is good for large projects, but probably not so much for a local public library. However even there, there should be some opportunities if you ask volunteers to assist. I don’t know how they could help, and maybe neither do you, but maybe if you ask, a volunteer might know. Volunteers are an opportunity to bring people to libraries to improve their services, we should not let financial pressures turn them into a potential enemy as is happening elsewhere.